Not in Ferguson. Copies: TAHO. The reward notice was enclosed in a letter from Kermode to Lt. Gov. 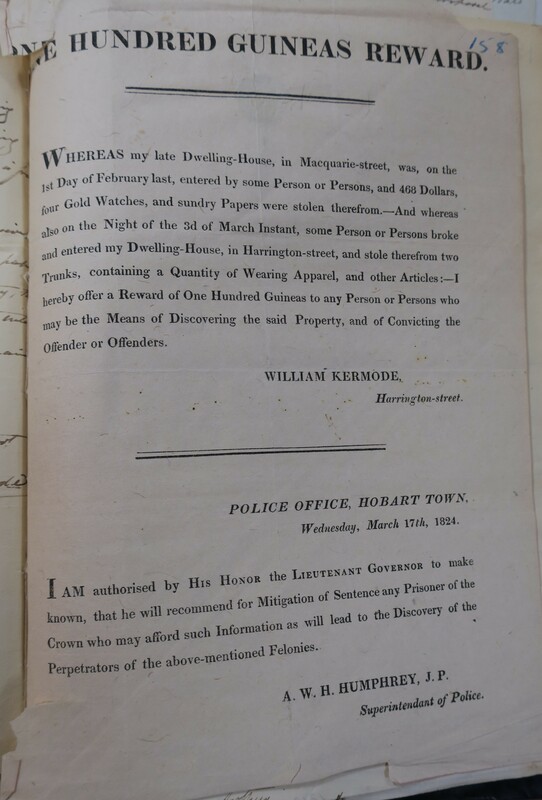 Arthur 18 Nov. 1824 and relates to robberies in Feb. and March 1824. 1 leaf ; 26 x 21 cm folded to 21 x 13 cm. Blind stamp of Commonwealth Parliamentary Library Petherick Collection. Printed on lightweight laid paper with 1817 counter mark. 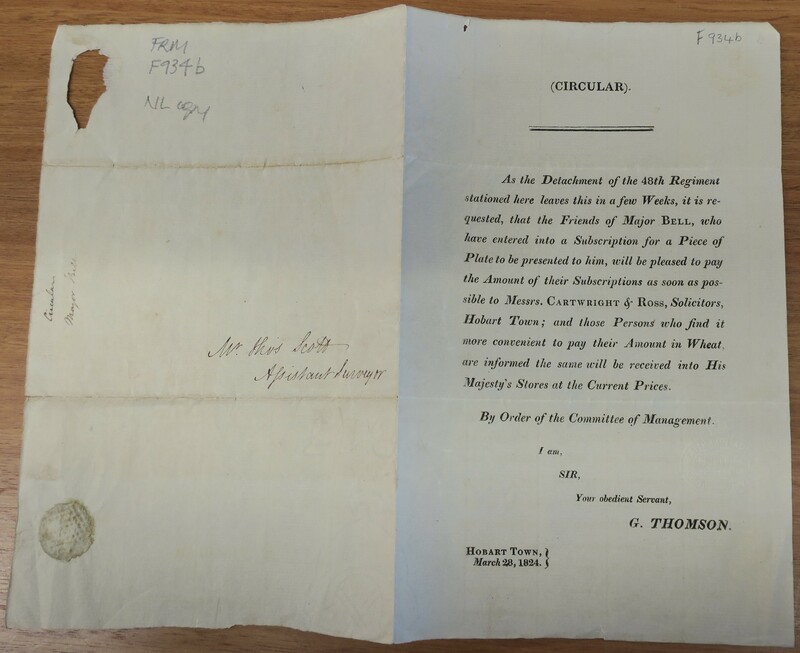 Circular is printed on right hand side of the sheet, which has been folded to form an envelope and sealed (evidence of sealing wax remains) Addressed to Mr. Thos Scott Assistant Surveyor. Regulations for the Ferry at New Norfolk respecting Persons crossing on Government Account. Hobart Town, April 17, 1824. Foolscap broadside.With manuscript corrections and additions. 12 x 20 cm. Private collection. License for a private boat made out to Major Honner. 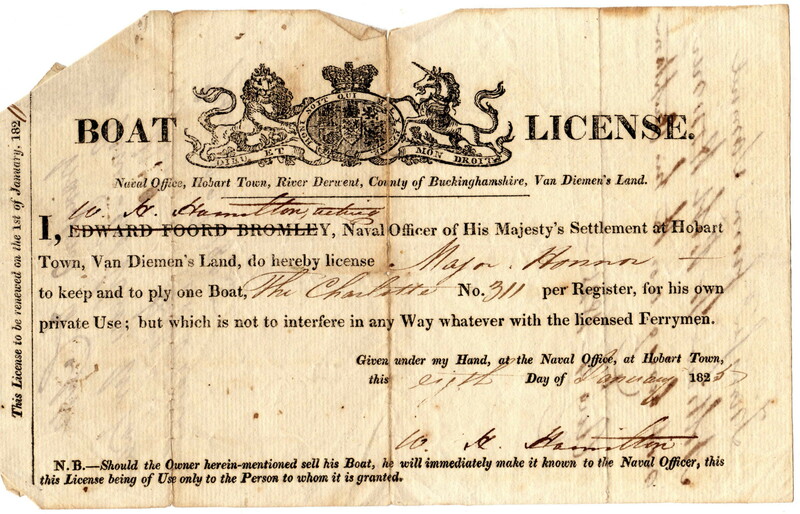 The name of Naval Officer Edward Foord Bromley is printed on the document. Bromley was suspended from office on 11 Oct. 1824, so it must have been printed before that date. It was issued by acting Naval Officer William Hamilton on 8 Jan. 1825. Wesleyan Branch Missionary Society. Monthly Report of District No. [printed form] ca. 1824. Several examples are in NS499/1/155: Administrative and Circuit Records of the Methodist Church in Tasmania. Filled in for 6 Dec. 1824 and various dates in 1825. General Rules, adopted by the Teachers’ Meeting, May 11, 1824. Ferguson 993a. Original is in TAHO NS499. Description based on photocopy in TSL. The rules, printed in narrow columns, have been cut out from some earlier printing and pasted into the Minute book of the Wesleyan Sunday School Union. Rule xii states that the Secretary shall furnish every teacher received into the Union with a copy of the general rules; and the School Secretary shall furnish the Parent or Guardian of every child with a copy of the rules for internal Government. This suggests that, as Ferguson assumed, the rules were originally printed as a broadside. There is also another photocopied sheet which reproduces two Appendices: Form of the report of Absentees Apr. 25 1824, and Form of school secretary’s monthly report presented to the committee April 13 1824. It is possible these were originally been part of the third Annual Report. 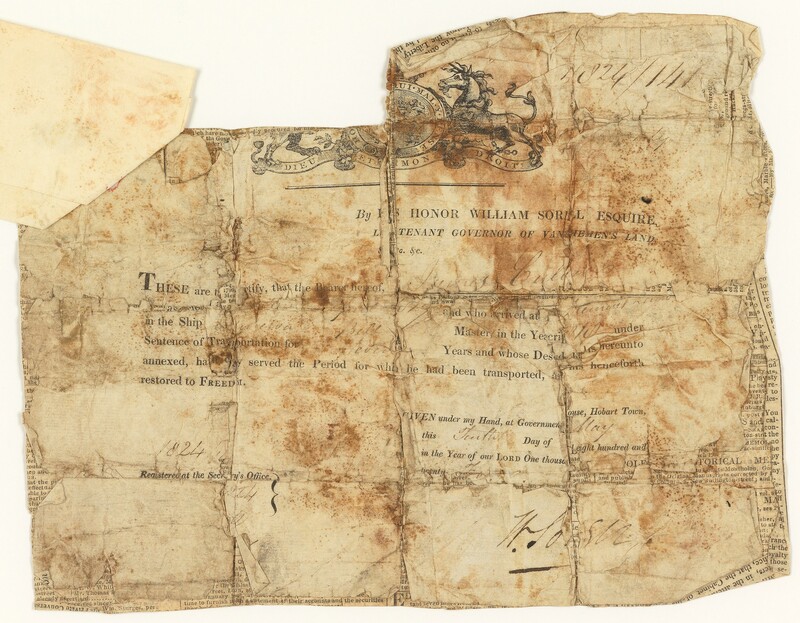 Two promissory notes in similar format. John Weavill. 1824. In: Tasmanian paper currency [album] / collected by Dr. William Edward Crowther. TAHO CRO.STORE 737.42 CRO. Six pence note (has been digitised) is 65 X 152 mm.